Oxford is a unique and glorious place. Small enough to be manageable and safe, full of young people from all over the world, it is the perfect setting for an inspiring and unforgettable summer experience. Student care is our top priority. LIGC students are looked after by our wonderfully caring student care professionals, Oxford Study Courses (www.osc-ib.com), a world leading provider of summer schools for school age students, to ensure that every student has a very personal, caring and supportive experience. 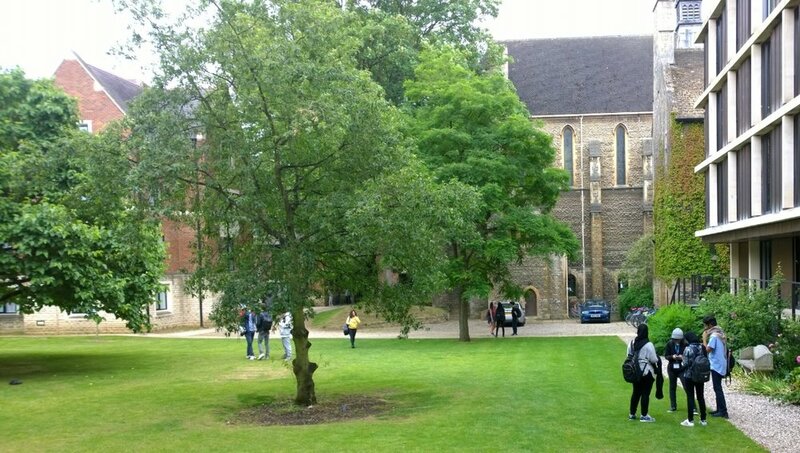 In Oxford, LIGC students live in St Antony's College, part of the University of Oxford, a beautiful college for graduate students in leafy North Oxford. They have lovely, single, study bedrooms in a charming setting around beautiful gardens. They have a short walk each morning across the wonderful University Parks to the School of Geography and Environment, where the ECI is located, in the University Science Area. Learning is active and stimulating, and enhanced with a fun packed social programme, exploring what Oxford has to offer. Our evening activities, after the initial Sunday welcome dinner, are usually a pizza night, punting (long flat boat propelled by a long metal pole) on the beautiful River Cherwell, Shakespeare in one of the college gardens, and a free evening with your new friends. To get to and from CAT in Wales, students travel by coach with the student care team. They live in the on site “self-build” house (don’t worry, it is already built! ), eating in the onsite restaurant which uses vegetables grown on site, and have trips out to the beach, and the Welsh mountains. The CAT site is just beautiful - quiet, peaceful and leafy. Students will explore the site and surrounding area, and in the evenings will have social activities - movies, ping pong games, dancing, and socialising. Live, eat and play in one of the famous Colleges of the University of Oxford. Oxford University is a collegiate university. That means that as well as a central university body, and academic departments, there are independent colleges which are powerful institutions in their own right. Oxford's permanent academics all have a college affiliation. They have an office and dining rights in their college, and are members of the Governing Body. Undergraduate and graduate students also belong to a college. They live, eat and work there, and often demonstrate fierce loyalty to their college, both during and after their time in Oxford. Colleges compete in sports and other activities, particularly rowing which is an Oxford obsession. St Antony's is a graduate college, housing only graduate students who are studying for a Masters or DPhil degree, as well as the academics. They specialise in Middle Eastern studies, but accommodate many university subjects. The college site is a 15 minute walk north of the busy city centre at the southern edge of leafy, quiet, north Oxford, the most affluent part of the city with its large Victorian buildings mixed in stunning modern architecture. They have some fantastic new en-suite accommodation, and some converted Victorian houses. LIGC students get a single study bedroom in one of other of these accommodation blocks. Students are allocated their rooms in a ballot. The food at St Antony's is some of the best in the university. Breakfast is huge and delicious, so everyone tends to get up on time! Lunches are in the University Science Area, nearby Linacre College, or students go and sample the fare at the buzzing Oxford Street Food Market. Students have dinner in college on Sunday when they arrive; we usually go out for pizza together on the Monday evening in a lovely local pizzeria, and on Friday there is a BBQ in College. On other evenings students are free to explore Oxford - there are many lovely places to eat. During the day we make our own drinks at the ECI, and have snacks to keep us going between meals! On trips out we take packed lunches. CAT is in a remote and beautiful area of mid-Wales, about 4 hours away from Oxford. If you choose this week you can arrive in Oxford on the Saturday, and we will travel between Oxford and CAT by coach or train on Sunday, through beautiful English and Welsh countryside, stopping en route for lunch in a lovely English in one of the many idyllic country villages. You are welcome to make your own way there and meet us there on Sunday afternoon to join the group.